Yes, that’s Hafthor Bjornsson, the world’s strongest man and The Mountain from Game of Thrones. And yes, he loves Pulse. Seriously though, I’m pretty excited to announce that Hafthor Bjornsson has been a big fan of Legion for some time now and is officially its newest ambassador. Want to welcome him to the team? Drop a comment on his Instagram post! That’s right! Our new caffeine-free preworkout is now available! It’s a new-and-improved version of the Pulse you know and love, without the caffeine. What’s new and improved about it, you wonder? Click here to find out. It’s perfect for people who don’t tolerate caffeine well, who prefer to get their caffeine from other sources (like coffee), and who like to cycle their caffeine intake. It tastes fantastic because caffeine is extremely bitter. 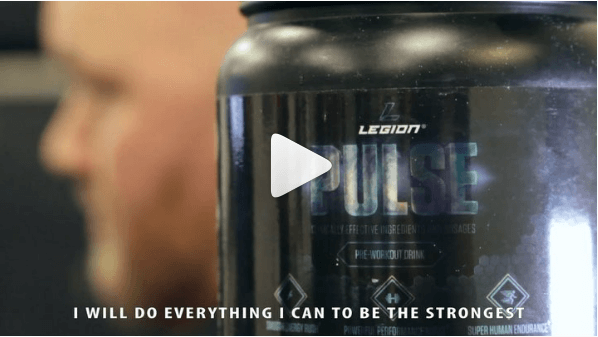 The bottom line is that with stim-free Pulse, you can reap all the training and muscle-building benefits of daily supplementation with ingredients like beta-alanine, betaine, and citrulline malate while also keeping your caffeine intake wherever you’d like it to be. Personally, I’m going to take the caffeined Pulse before my hardest workouts (squats and deadlifts) and the stim-free before my less intense ones (like arms and shoulders). Black Friday and Cyber Monday were insane! I figured the weekend would go well but it blew my expectations away. We had highest-ever (sales) days and wrapped up a highest-ever month, so THANK YOU to everyone who supported us by shopping and spreading the word. We’re working on a customer loyalty program. It’s one thing to say “thank you” and another to do things to prove you’re thankful. That’s why we’re creating a customer loyalty program that’ll allow you to earn points on all Legion purchases—points that you’ll be able to redeem for free 2-day shipping, product discounts, free products, and more! We’ve chosen the platform, created the rewards structure, and are now working through the website design phase. We expect to have the whole project done and ready to launch in January or February. P.S. The protein bars have been delayed a month or so due to manufacturing bottlenecks, and as a new customer, we get bumped before others. But don’t worry, the bars ARE coming. Thanks again for all of your support, and if you’re half as excited for everything we have in store as I am, share this article on Facebook, Twitter, or wherever your favorite online hangout is.